Hi there! Welcome to the inaugural dashboard from Data Dozen. I’m so glad you’re here. And if you’ve never opened Tableau before, you’re in the right place. I designed this dashboard specifically for you. 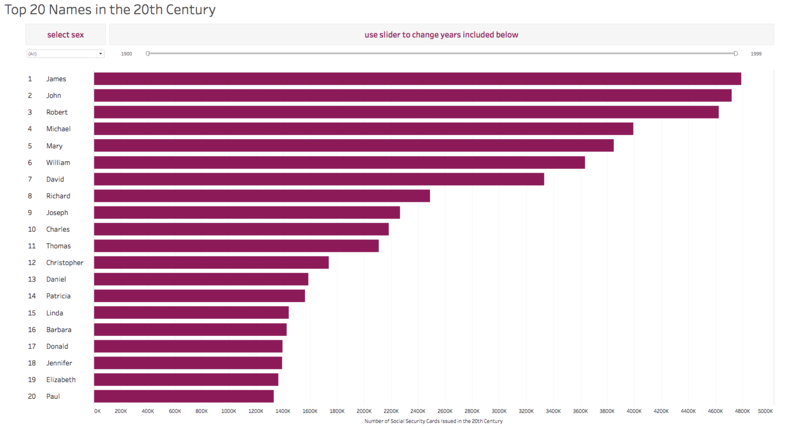 This bar chart will give you a peek into the best of Tableau: the drag and drop interface, powerful filters, nimble table calculations, and aesthetic flexibility. Let’s dive in! Dashboards 1 through 5 all use the same data. It’s a super simple data set (seriously, it’s just four variables) and it’s all about first names from U.S. social security cards in the 20th century. Click Here to download the data and create your own dashboard along with the videos. This is the best way to build up those Tableau skills! Step 1 of this dashboard previews the data and walks you through how to connect the CSV to Tableau. Thanks to Data.gov for making data like this public! If you’re brand new to Tableau, congratulations on building your very first dashboard! I’d love to see what you’ve created. Just include your Tableau Public profile in the comments below. And of course, share your thoughts about Dashboard 1. What do you like? What don’t you like? I can’t wait to hear from you.